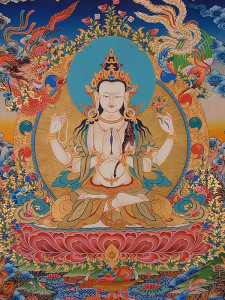 If there are sentient beings who need someone in the form of a Buddha in order to be liberated, Chenrezig (Avalokiteshvara, Kwan Yin, Kannon) immediately manifests as a Buddha and speaks the Dharma for them. If they need someone in the form of a Solitary Realizer to be liberated, the Bodhisattva immediately manifests as a Solitary Realizer and exemplifies the Dharma for them. If they need a Disciple to be liberated, the Bodhisattva immediately manifests as a Disciple and speaks the Dharma for them.